Once upon a time, I bought a wood burning and stencil tool thinking it would be a fun hobby that would allow me to make all sorts of unique handmade signs. I brought it home, fired it up and remembered I don’t like the way I draw, and screwed up every stencil I attempted to make. I shelved all of my stencil making dreams along with the tool in m craft room. Recently the super nice people at Stencil Revolution asked me if I wanted to try their laser cut stencils to make a project – no strings attached. Since there was absolutely no pressure and I wasn’t sure I was going to publish the project because I tend to overload the stencil with too much paint and ruin the project. 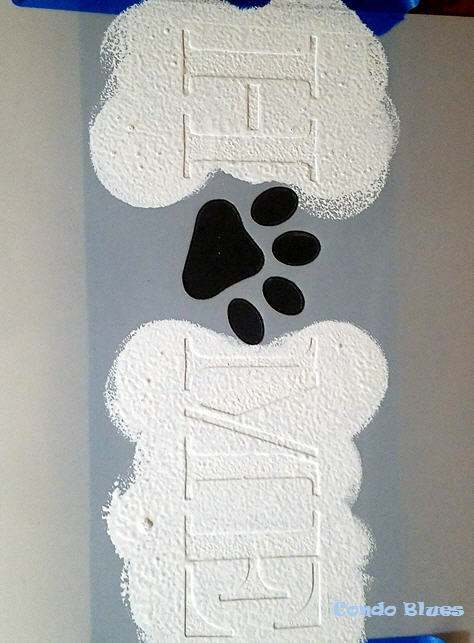 I saw the perfect dog related decorative Stencil Revolution stencil for our house, and given the no pressure requirements of the trial, I decided to cross my fingers and Lacey's paws, jump out of my comfort zone, and say yes to their kind offer. Wood sign work in progress! 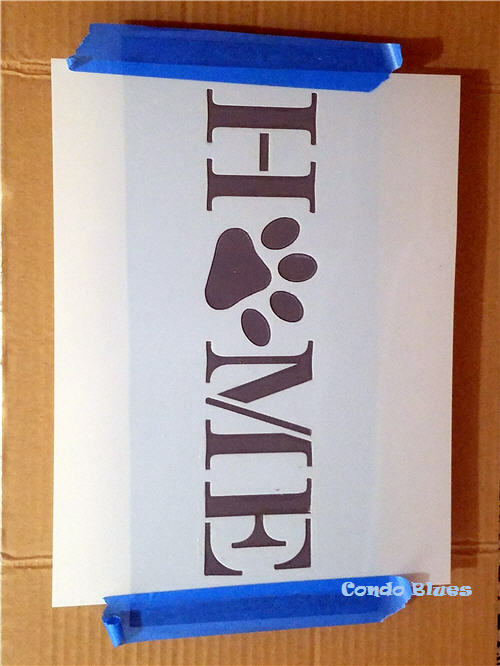 I wanted to bump a sign project with more than just two different colors of paint to make the paw stand out. Think, think, thinkidy, think.... hey! 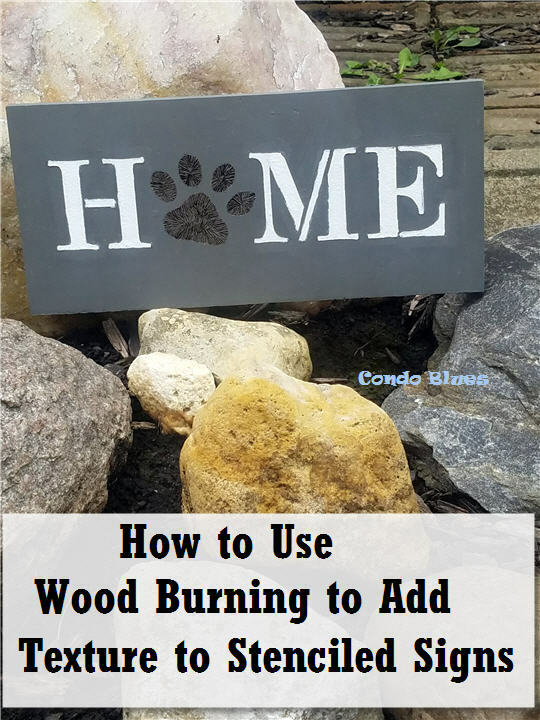 What about using that old woodburning tool? I love the end result! So much that even though I'm not required to write a Stencil Revolution tutorial, I like the product and what I can do with it beyond the obvious. I want to share with you how to add something extra to your painted stencils with a simple woodburning tutorial. I practiced using the wood burning tool on scrap wood before I started my project. Good thing. My first attempts at outlining Lacey's paw were pretty wonky. It also let me try several wood burning techniques to fill the fill the sold areas of the paw until I found one I liked. Pin this tutorial to your Pinterest boards! Share it with your friends! Disclosure: I am including affiliate links in this post for your convenience. 1. Use the sand paper to remove any rough edges or burrs from the unfinished wood sign. Remember to always sand with the grain of the wood! 2. Use the paint brush and craft paint to paint the unfinished wood sign gray and allow the paint to dry. I needed use two coats of craft paint. 3. Position the stencil in the center of the unfinished wood sign and use the painter’s tape to tape it in place. 4. Use the paint brush to seal the edges of the stencil down with Mod Podge where the stencil meets the wood and allow it to dry.This will help prevent the craft paint from bleeding under the stencil in Step 6. 5. Pour the white paint on the paint pallet, load the paint pouncer with craft paint, blot it on a piece of scrap paper if you don’t have the room on your pallet, and use the pouncer to apply a thin coat of white paint to the stencil. Caution: A thin coat is less likely to leave blorps of paint under the stencil unlike a thick coat of craft paint. Guess how I know? I panicked because I chose to paint white on gray and painted my stencil with a too thick coat of paint even though I did a white paint on gray paint test on scrap wood before I started the project and it was visible. Tip: You can fix the areas where paint bleed under your stencil by very carefully painting them out with the gray background paint and a small paintbrush. Again, guess how I know? 6. 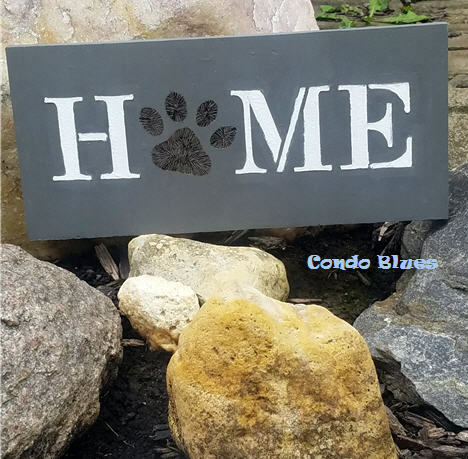 Use the pencil to outline the paw print part of the stencil onto the painted wood sign. 7. Carefully remove the painter's tape and stencil while the craft paint is still wet and immediately wash the craft paint and Mod Podge from the stencil so it will be perfect for your next product. Allow the paint to dry completely before moving to Step 8. 8. 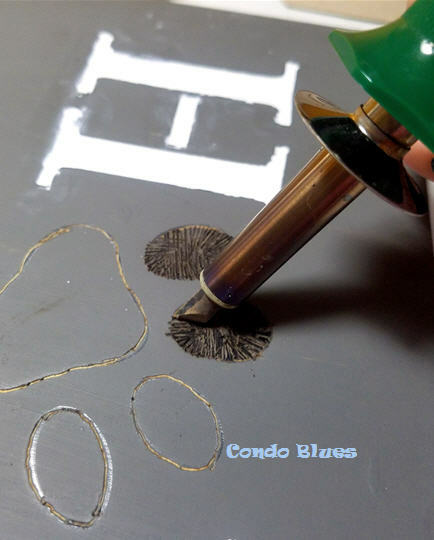 Use the wood burning tool and tip of the universal tip (or you can use the straight tip) and following the pencil outline, outline the paw print shape. Tip: I like to use a piece of painter's tape to tape the stand of my wood burning tool to my work surface so it doesn’t tip over while I’m working on my project. 9. Use the angle tip fill in the paw print shapes. 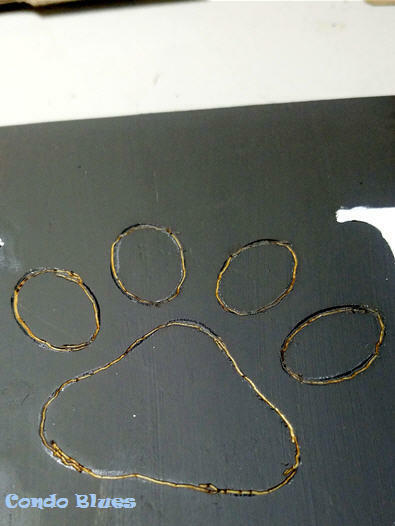 After experimenting on a scrap piece of wood first, I filled in the paw print by burning lines using the full edge the angle tip into the wood side by side until each shape with filled with burned lines. This wood burning technique reminds me of the bottom texture of Lacey’s paws. 10. Use the hammer to attach the saw tooth picture hanger to the back of the wood sign. 11. Display proudly in your home! I’m no longer a wood burning or stenciling failure! I love the finished product and how the wood burning adds texture to my painted wood sign.